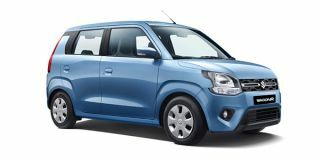 Maruti Wagon R VXI AMT is the mid petrol variant in the Wagon R lineup and is priced at Rs. 5.17 lakh (ex-showroom, Delhi). This base variant comes with an engine putting out 67bhp@5500rpm and 90Nm@3500rpm of max power and max torque respectively. The gasoline motor comes mated to 5 Speed Automatic transmission which is quite a joy to use. Maruti claims an average of 22.5 kmpl for this mid VXI AMT variant. Q. What is the difference between Wagon R base model and Lxi optional? Q. Which of this version is advisable LXi or VXi? Q. How these variants are different from each other - LXI, LXI (O) and VXI? They're different in specifications and other features. Q. Sir I want to purchase Alto k10 VXi or Wagon R LXi 1.0. which will be better among both cars. Q. What are the features of Wagon R base model and on the road price? Q. Wagon R 1.0 aur 1.20 mein se kaun sa model best hai?